More than 230,000 acres of land have been burned over the past week in two California wildfires, the Camp Fire north of Sacramento and the Woolsey Fire north of Los Angeles. Nearly 70 people have died and more than 600 are still missing. At least 12,000 structures have been destroyed and more than 52,000 people have been evacuated. Camp Fire is the deadliest wildfire in California history with 63 deaths, more than doubling the 1933 Griffith Park Fire, which killed 29 people in Los Angeles. Paradise Church of the Nazarene Pastor Lloyd Tremain’s home in Magalia — just north of Paradise — was included in the homes destroyed by Camp Fire. The Tremain family are currently staying with family members in Sacramento. Lloyd said it appears that the entire Paradise church congregation, apart from one family, lost their homes. So far, the Paradise Church appears to still be standing, but the condition of the back side or interior of the main building is unknown at this time. It has been confirmed that the church’s second building, which houses the youth center and compassionate ministries, is destroyed. Several organizations and churches have created evacuation centers to help those who have been displaced. The centers at the Chico East Ave. Church of the Nazarene and Oroville Church of the Nazarene are at capacity, housing approximately 700 evacuees in total. The Oroville shelter is still offering meals and other services to those who are displaced even if they don’t have room to house them. “You don’t have to stay here to get services,” American Red Cross Regional Communications Director Steve Walsh told the Chico Enterprise-Record. The Chico East Ave. shelter has been made into a makeshift clinic since the hospital in Paradise — Adventist Health Feather River Hospital — was so badly damaged. The clinic started when four volunteers who worked at the hospital came together to serve the needs of their community. Enough medical volunteers have gathered now to form an entire medical team. As of Friday morning, Camp Fire is 40 percent contained and Woolsey Fire is 62 percent contained. 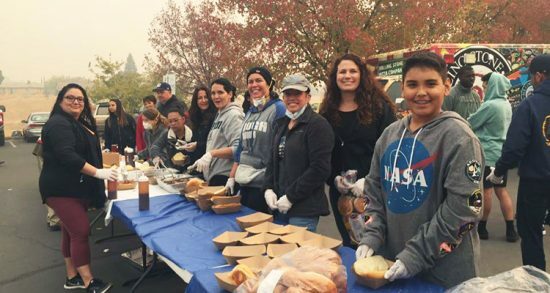 Prayer is requested for the Tremain family, the Paradise church congregation, those volunteering to bring relief, and the rest of the victims affected by the wildfires.